Suicidal Cycles | "From Modified Stock to Full Radical Custom"
"From Modified Stock to Full Radical Custom"
Owner and builder Jason Glatt has not only been modifying and building bikes since early childhood, but pretty much anything else he could get his hands on. Jason comes from a family that take pride in quality work and doing things for themselves. 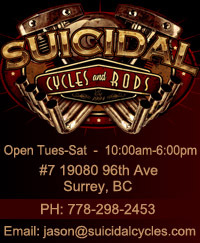 Combined with his love of mechanical and custom work “Suicidal Cycles and Rods” was ment to be. Originally started in 1995 under the name “Glatts Hot Rod Bikes” with his brother Keith, The primary focus was centered around designing and marketing custom billet parts. As time went on, Jason found himself following up with more and more custom fabrication work, soon gaining a loyal following of clients looking for one-off craftsmanship, as opposed to bolt on parts from the catalogues. The name “Suicidal Cycles and Rods” came on the heels of a particularly bad accident involving a long chop and a transit bus. Not much survived the incident aside from a Jason, a tangled mess of metal and the name. Jason has payed his dues working after hours in a small backyard garage nicknamed “the Dungeon” (for obvious reasons to anyone who ever saw it) while working his day job as a parts manager at the local Harley dealership (Trev Deeley). 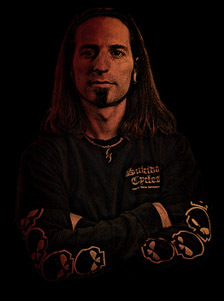 For 10 years Jasons life was nothing more than work all day….build all night. After years of honing his skills, and evolving his own inventive personal style of building, Jason managed to gain enough notoriety and demand for his custom creations he officially had the opportunity to quit his day job and start Suicidal Cycles and Rods Inc.
From one of a kind handmade frames, custom scratch built tanks, or anything else he can make from steel or aluminum, a wide range of machining and precision work, Suicidal can do it all. Jasons gaurentee is that no two bikes will ever look the same, you are always promised a truly original one of a kind piece of art that will stand out everywhere. 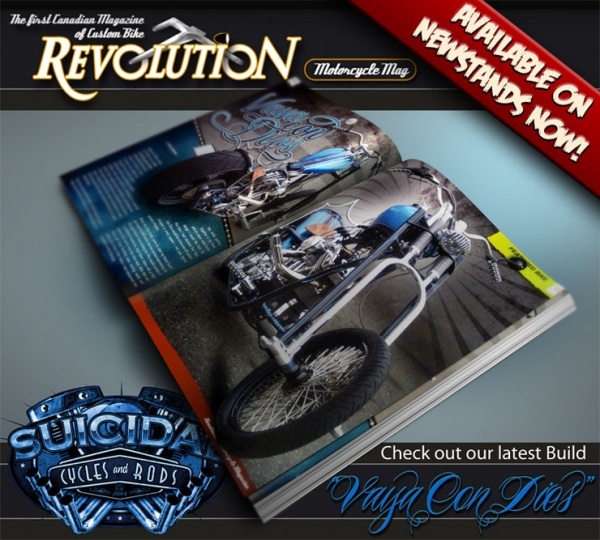 From magazines, commercials for TV, movies, and numerous bike show awards Suicidal Cycles and Rods have proven themselves as a one of a kind shop where dreams are brought to reality. © 2009 Suicidal Cycles & Rods. All rights reserved.